Obviously we've got an email Pingin dong with our own domain name, eg: yourname@yourdomain.com. Nha google now provides the facility to create an email such a way that fairly easily. But unfortunately this time the facility can not be used for are blogs still using blabla.blogspot.com domain. This facility is only to have their own domain, eg domainmu.com,. Net. . Org. doamin and other top level. So it was for those who want to, miss domain purchase, I recommend buying at dodoldomain.com, cheap lho (promosi. .. he .. he ..). Then, the domain pake "co.cc" can not? I say "may", but now I discussed with this Pingin domain .com / .net / .org, etc. first. for those who have a domain "co.cc" wait for now.Ok let's start the tutorial about how to make their own email. For those who use the DNS settings of the control park that's how: Click the domain you who are in "Domain list". After that option "Type" select who "MX". In the "Mail Domain" kosongi just that column. In the column "Order" fill in data2 "Priority" above. Then in the "mail server" fill in the data "MX Server Address" above and then click the button "All Update". so continue until all the data entered above. For those who use the DNS settings of the dodoldomain.com how: go to menu "Domain -> List last 10", then click the "Managed DNS", then click Manage DNS Records. After that, click the "MX Records" then click the "Add MX Record." For the column "Value" select who under (who "Type In A Fully Qualified Domain Name eg. Abc.pqr.com. '). Input the data" MX Server address "in the column. Then input the data" Priority "dikolom" MX Priority ". so continue until completed all data entered.8. if already finished click the button "I have completed These Steps." Then the page will appear like this anymore. 9. Actually up here can already completed, to open an email tp km, km alamt need to type a URL like this "http://mail.google.com/a/yourdomain.com". 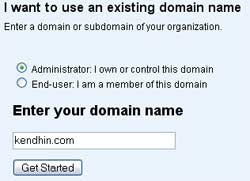 Nha klao eg km Pingin replace it to be like: "http://mail.yourdomain.com" then follow these steps again. 10. Click on the link "Email" will display the page "Email settings"11. Then click the "Change URL", then the page will appear to "Change the URL for email".12. Select who "custom" then click the Continue button.13. After that first DNS km km settings, add "CNAME Records" and enter "mail" in the "Hostname" and insert "ghs.google.com" dikolom http://naldoton.blogspot.com "Value"14. After that, click the "I have complete These step"
now you can already have an email with the name doamin own blog. For other settings taught myself yes. Ok!